These are the resourceful info that we must have here in Malaysia. Just imagine if we can get this, what do you think? Blogging is one aspect in democracy which practicing a freedom and right to speak. I don't mean or want saying it in our own situations. 1- Bloggers can be journalists (and journalists can be bloggers). If you engage in journalism, you're a journalist, with all of the attendant rights, privileges, and protections. 2- Bloggers are entitled to free speech. Internet bullies shouldn't use copyright, libel, or other claims to chill your legitimate speech. 3- Bloggers have the right to political speech. 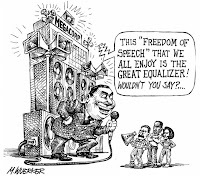 To ensure that the Federal Election Commission (FEC) doesn't gag bloggers' election-related speech. 4- Bloggers have the right to stay anonymous. 5- Bloggers have freedom from liability for hosting speech the same way other web hosts do. Freedom or human-right often being forbid by somekind a recognisable ideology which known as fascism (Eventhough some says fascism not consider as a bad ideology but most proof shows that it's doesn't contain any supporting ideas for human-rights).